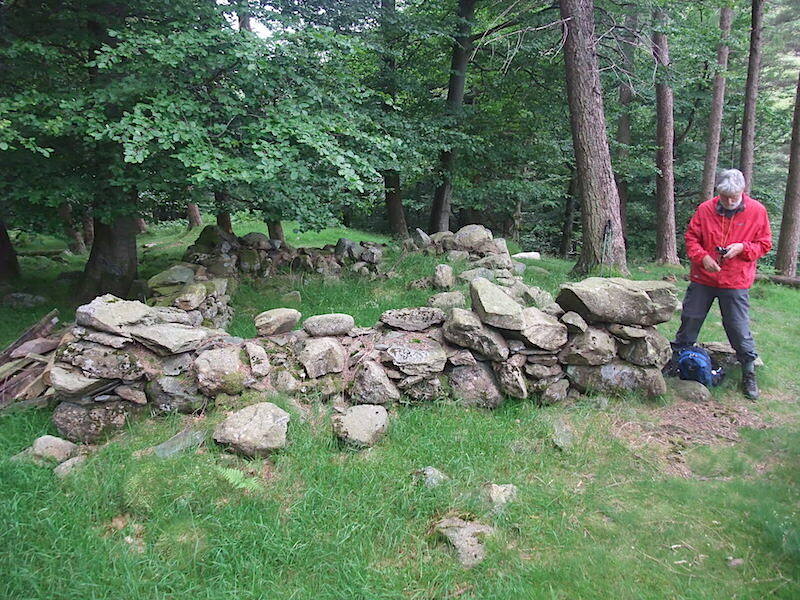 Today’s walk starts at the Dob Gill car park on the western side of Thirlmere. 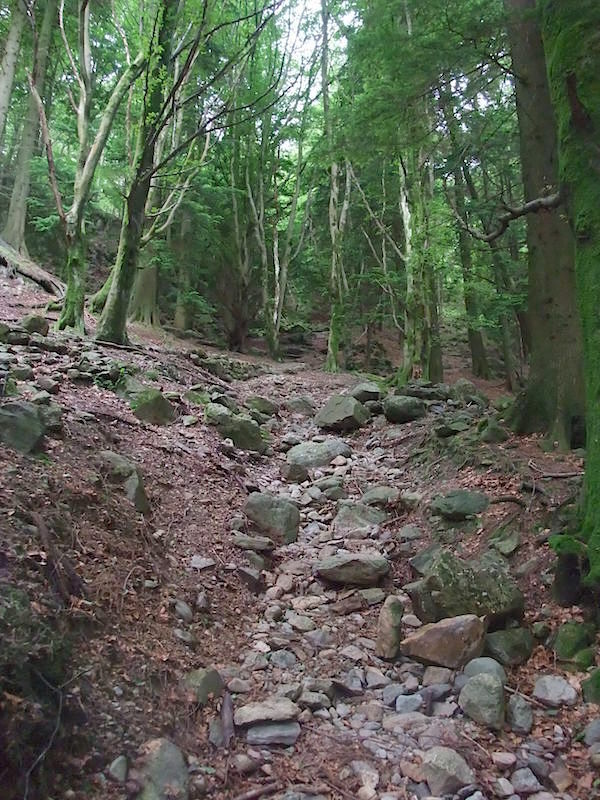 This is looking up the path as we start out, its a bit rough underfoot and there’s not a lot to see just yet as we are walking up through the forest. Walking through any forest is always a bit dark and gloomy and its even more so on a very overcast day like today. 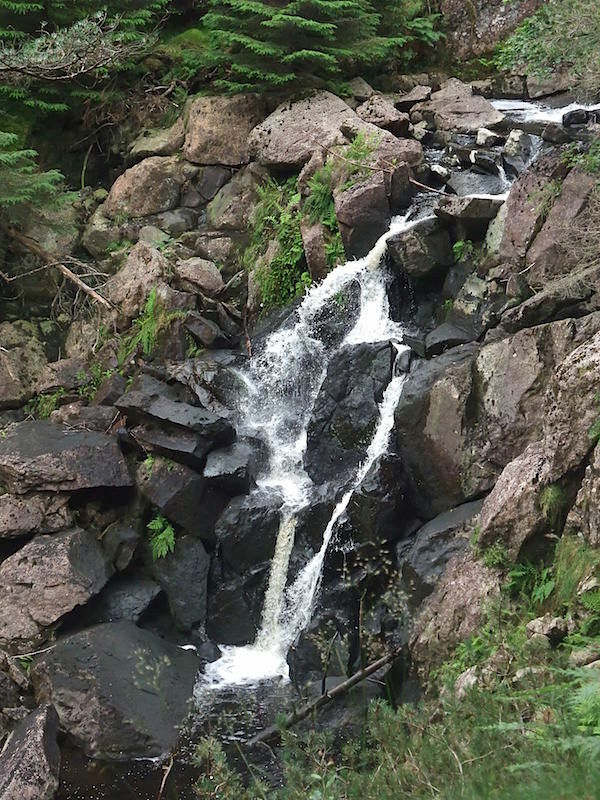 One of the several waterfalls in the gill as we make our way up to Harrop Tarn. 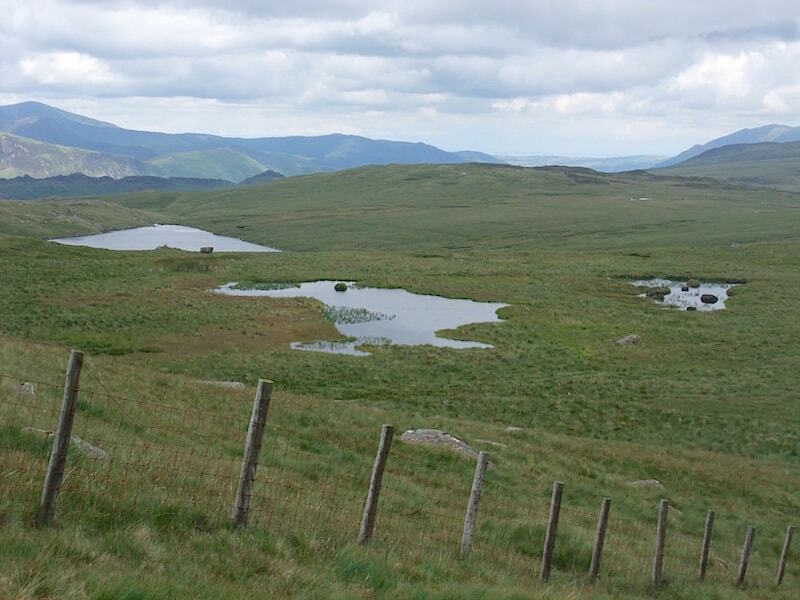 Harrop Tarn with Tarn Crags behind. This is a lovely, peaceful little spot, especially on a better day, although the tarn does seem to be silting up and getting very close to it would mean getting wet feet. 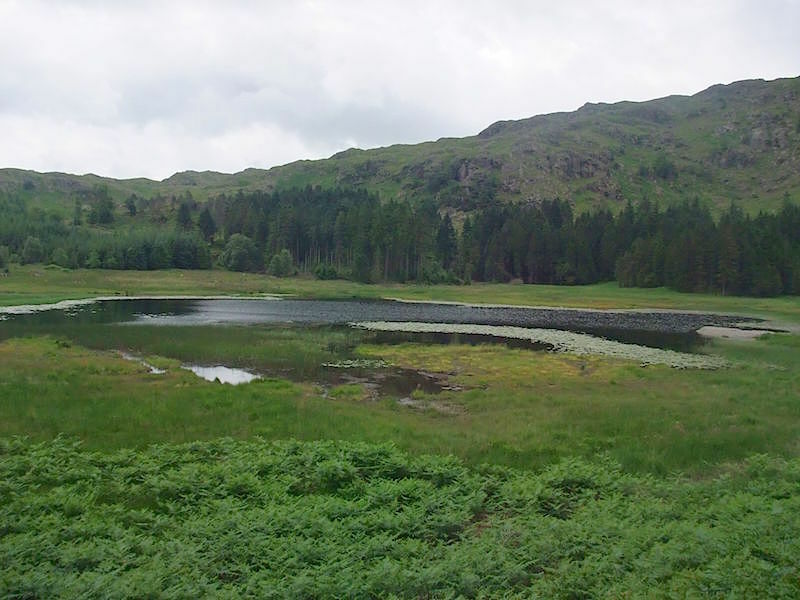 Another view of Harrop Tarn as we take the path to the right of it and head off up into another section of the forest. 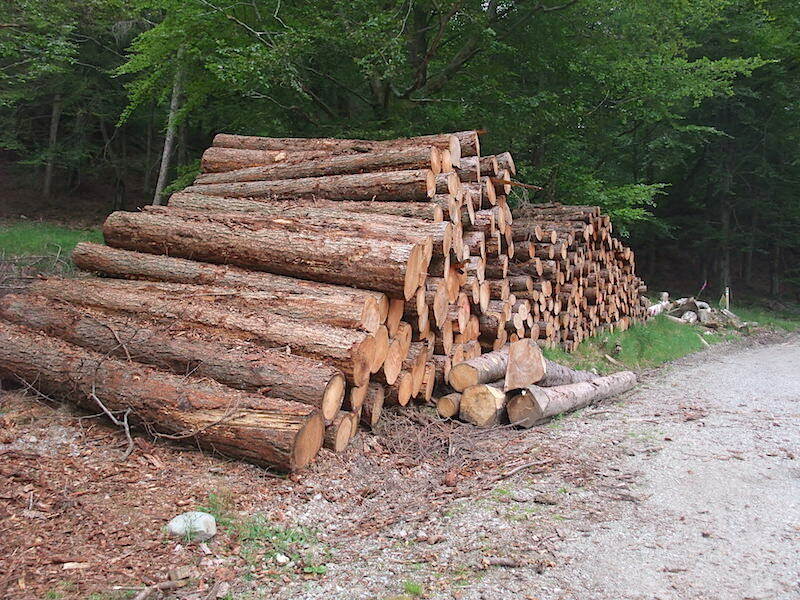 The end product of logging operations in Thirlmere Forest. 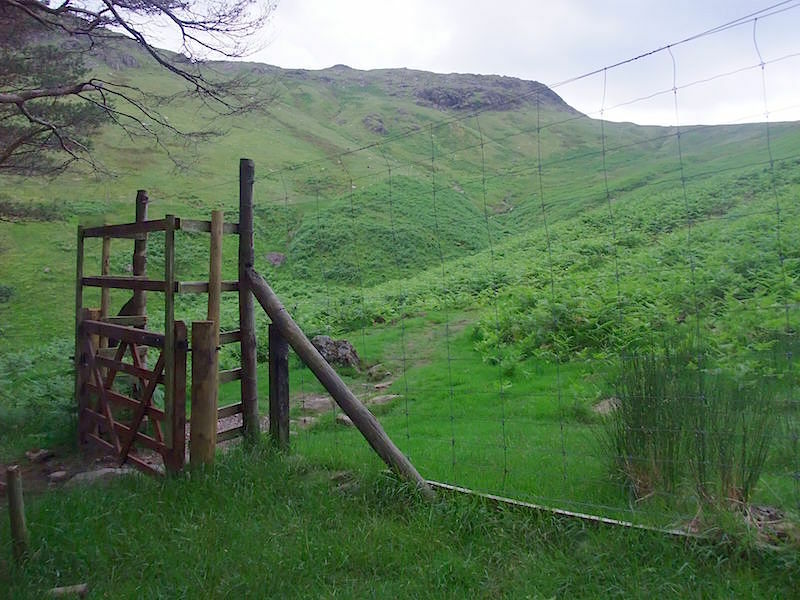 We’ve reached the edge of the forest and just to my left is a gated fence which allows access to the open fell side. The view from the gated fence out on to the open moorland with Standing Crag on the skyline. The fence and gate are built high enough to prevent deer jumping over and getting into places where they aren’t meant to be. 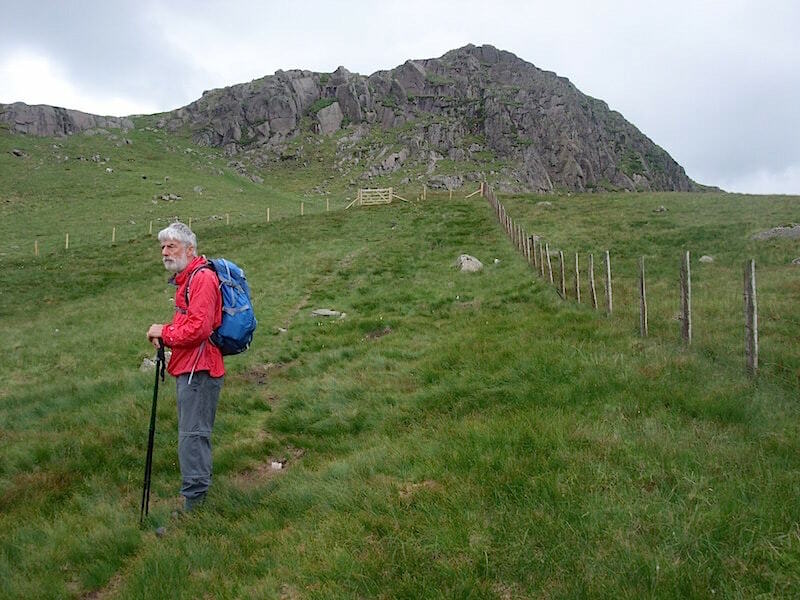 We continue across the open fell until we reach the fence where we need to turn left towards Standing Crag over there in the centre.There’s no need to climb the crag as the path very obligingly skirts it round to the left and heads for the little grassy gap. 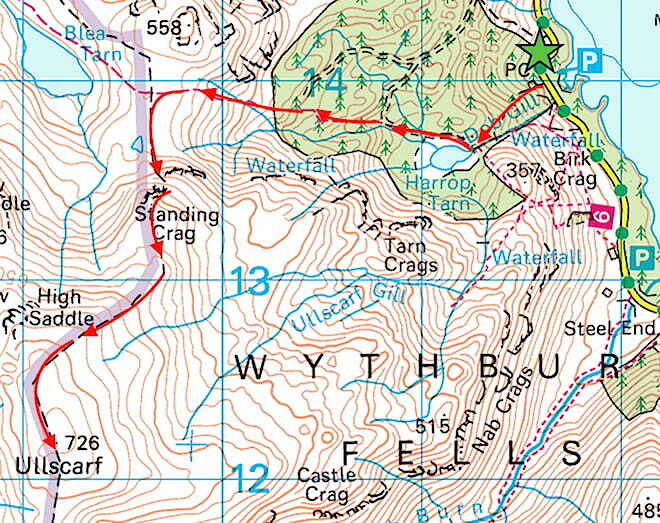 Once there its a right turn over Standing Crag’s grassy back slopes. 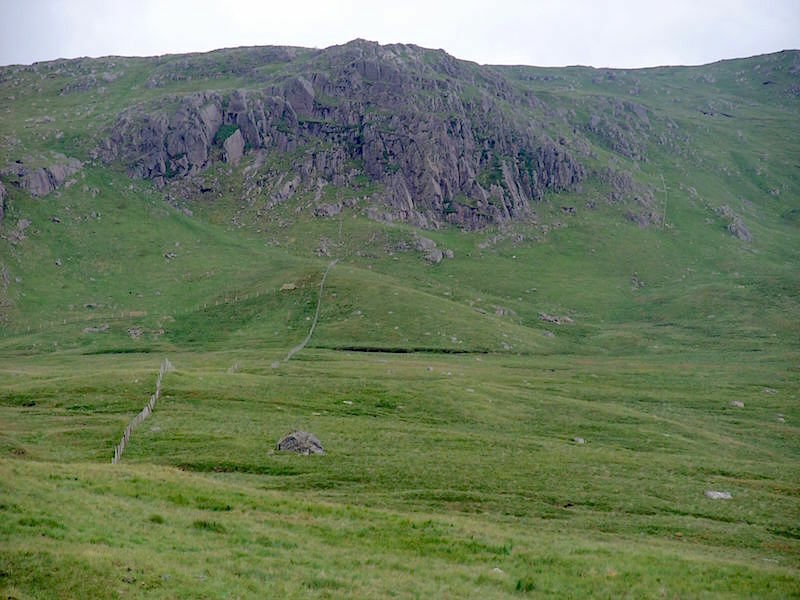 You can see the route of the path over on the top left, its the darker green line running up to the skyline. 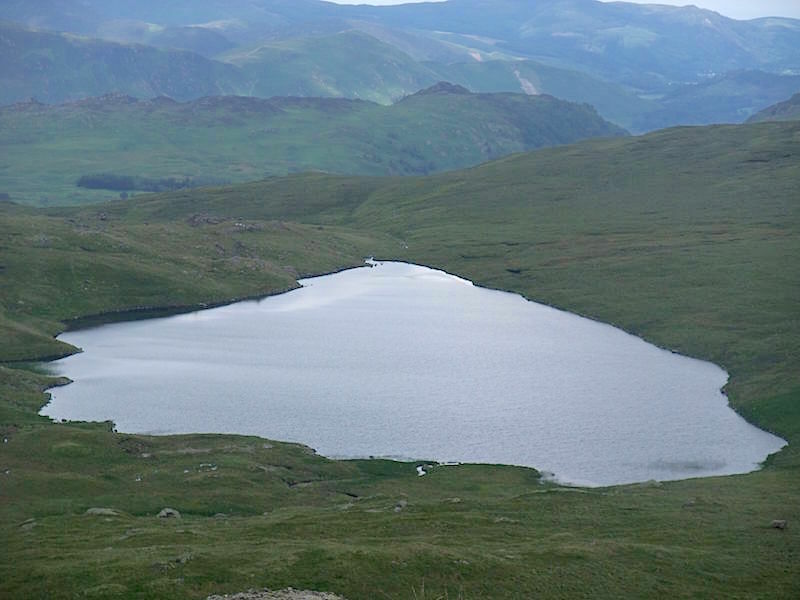 The view from the Standing Crag path with Blea Tarn on the left and a couple of smaller tarns nearby. That is a very wet area normally and not somewhere you’d choose to walk after prolonged periods of rain. 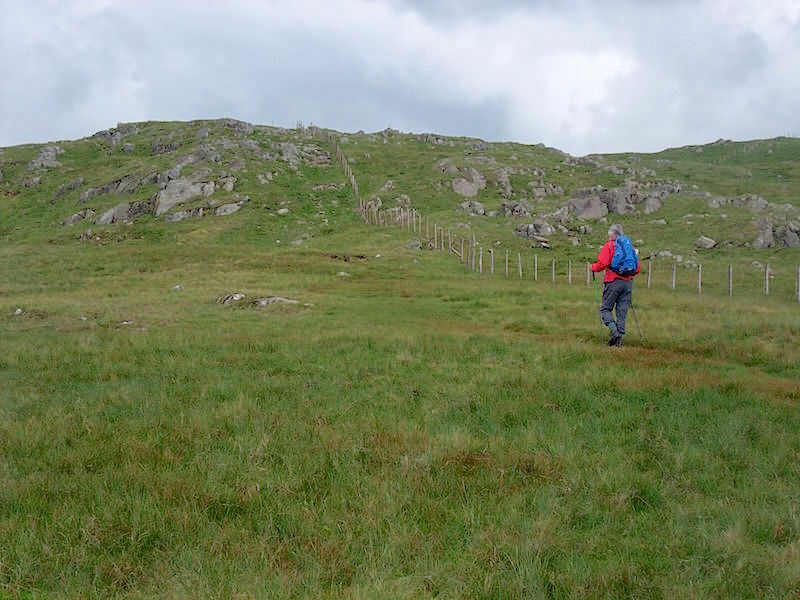 Following the fence posts and heading for Ullscarf. That’s not the summit though, its just an old fence corner post. Ullscarf summit is only about five minutes walk from this point. 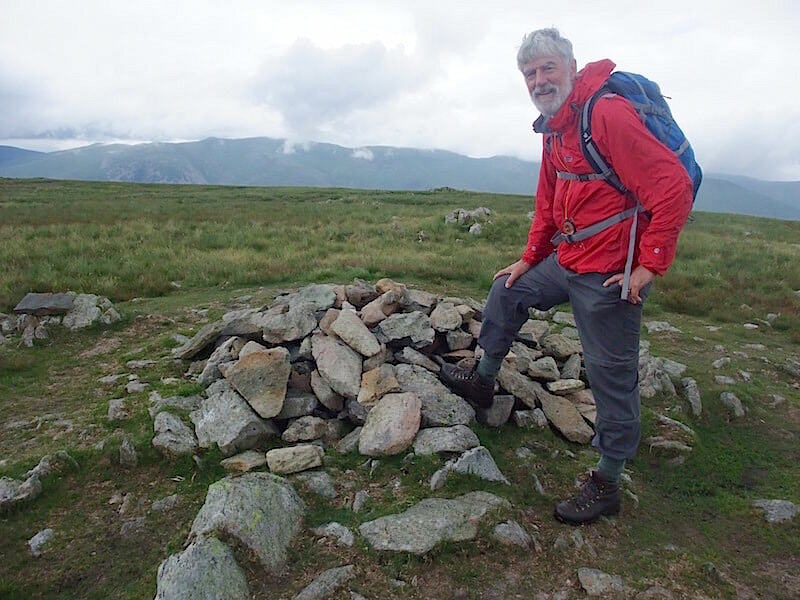 The summit cairn on Ullscarf. 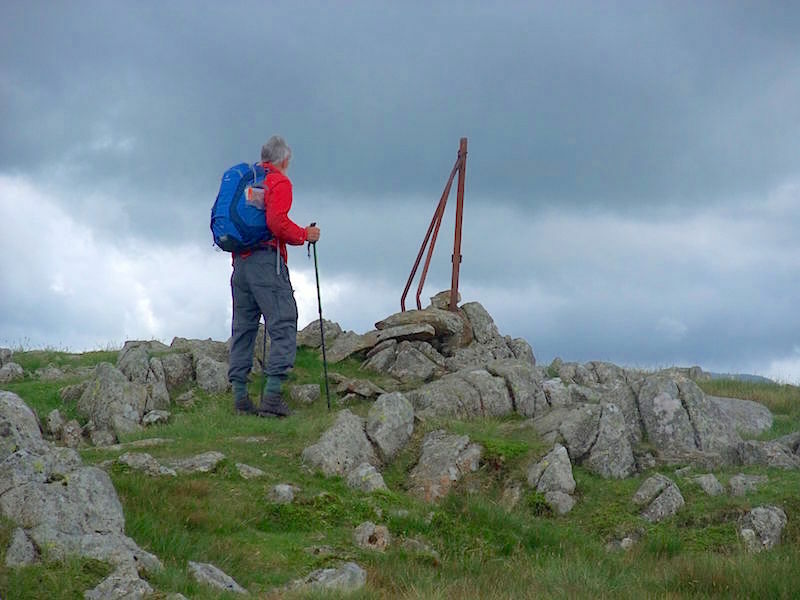 Its not the most exciting summit in the world, just a large grassy plateau with no interesting features other than cairns dotted here and there, and the dullness of the day didn’t improve it much either. 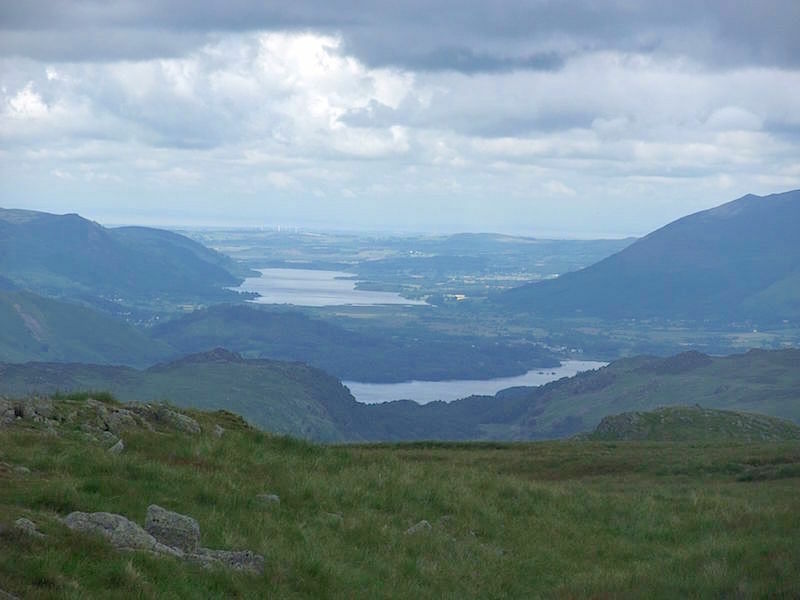 I did a bit of wandering around to find a few interesting shots, here the view is of Derwentwater, in the foreground, with Bass Lake beyond it. 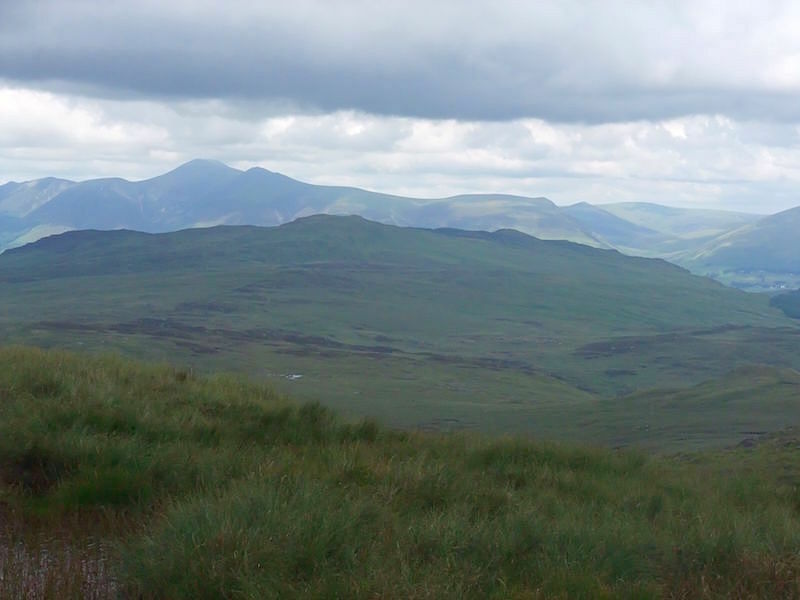 Looking north to Skiddaw, the high point to the left of the skyline, to the right of that is Skiddaw Little Man, then a long sweep down to the right again to Lonscale Fell. To the right of Lonscale is Great Calva and to the right of that is Knott. Not The Knott which is over at Hartsop and part of the far eastern fells, just Knott which is part of the northern fells. Confusing isn’t it? 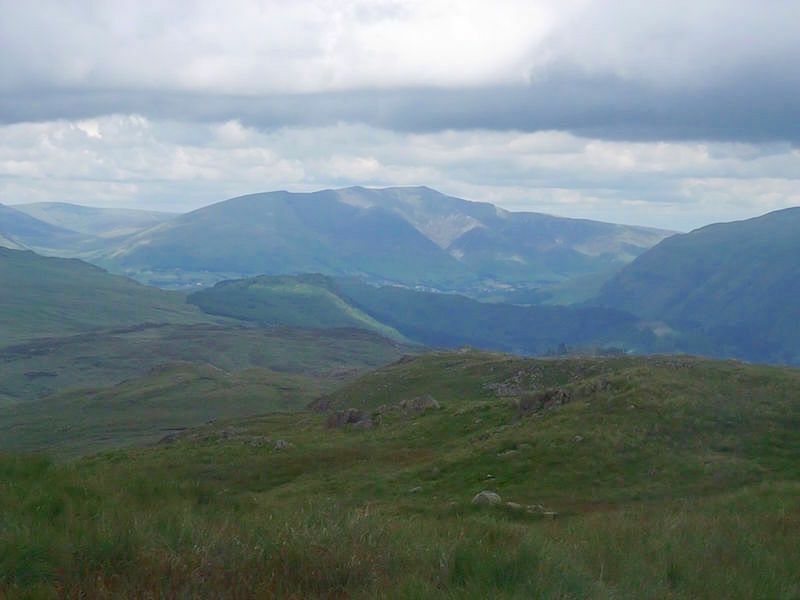 You don’t get confused with this one though as it is the instantly recognisable Blencathra, taking up a great deal of space over there on the skyline. 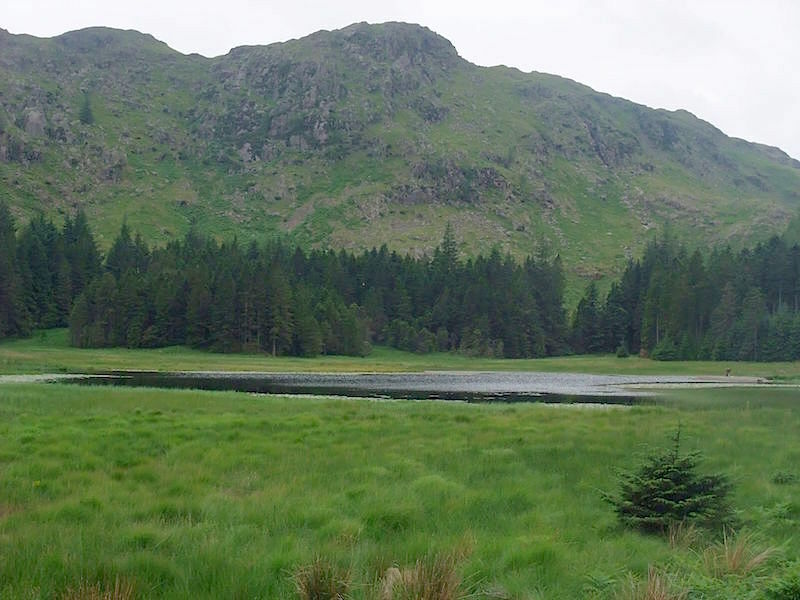 A view of Blea Tarn as we begin to descend. 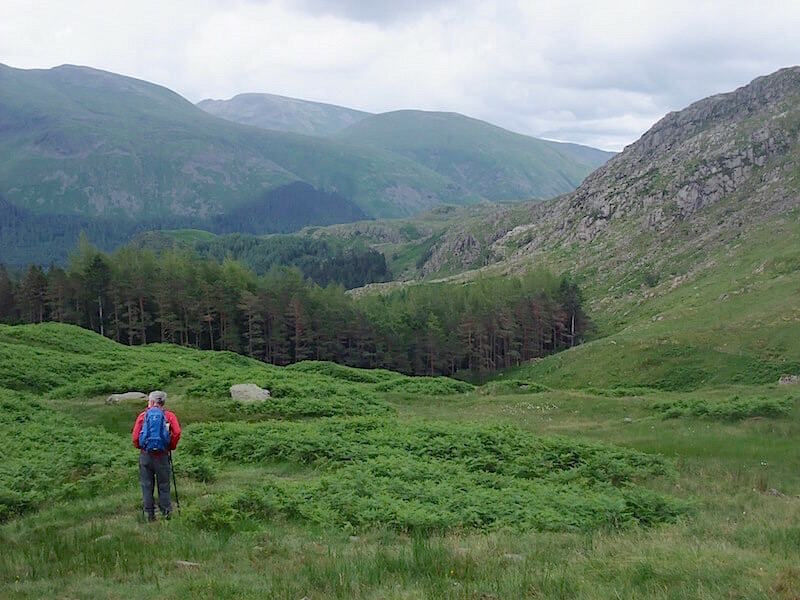 So that’s it for today as we make our way back down to Harrop Tarn and then the Dob Gill car park, with a view of some of the fells around Helvellyn. Not the best of days though as the sun never came out of hiding, but at least we stayed dry.